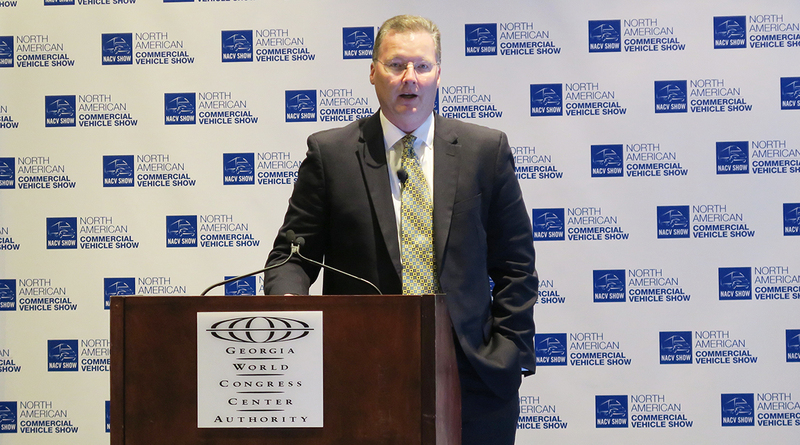 Through that partnership, Ryder will equip all new heavy-duty rental trucks with Aperia’s Halo Tire Inflator systems, the companies announced Sept. 27 during a joint press conference here at the North American Commercial Vehicle Show. Ryder already has an advanced tire-pressure management program for its trucks, but “once that product leaves our possession, tire inflation becomes a major issue,” said Scott Perry, Ryder’s chief technology and procurement officer. Inadequate tire pressure can weaken fuel efficiency and lead to tire failures, which are a major source of downtime for fleet customers and a drain on Ryder’s service operations, he said. “This is a product and a relationship that we think is going to have a significant impact on our overall operations and cost and our value proposition to our customers,” Perry said. Josh Carter, co-founder and CEO of Aperia, said the Halo system can boost fuel efficiency by 1-2% and extend tire life by 10-15% while improving safety and vehicle uptime. Halo is a bolt-on system that uses the wheel’s rotational motion to pump and maintain ideal tire pressure. The product’s design enables it to be installed on both tractors and trailers, unlike traditional automatic inflation systems that route air lines through the axles and are focused mostly on the trailer. “We’re really excited to be able to bring the value to other wheel positions for our customers,” Carter said. Perry said Ryder already has installed the Halo system on “hundreds” of rental trucks and will continue to deploy the system rapidly as it replenishes its fleet. Beyond its rental trucks, Ryder said it will make the Halo system the preferred tire inflation option for its long-term lease customers. Ryder also plans to offer the Halo system through its SelectCare service, where Ryder provides full-service maintenance and support for customer-owned vehicles. Perry said the Halo units are simple to maintain.